Maps showing the status of the data streams from each GCN station can be found on the PSMSL website here : status maps. Click on the map (above) to see the overall operational status of the GLOSS core. GLOSS is a global endeavor requiring the coordinated participation of an international group of agencies. In addition to SONEL, the following data centers provide complimentary GLOSS data streams while helping to shape the future of the global in situ sea level observing network. In general, GLOSS data centers are associated with scientists involved with sea level research, which helps to maximize the quality of GLOSS datasets. The Flanders Marine Institute (VLIZ, Belgium) hosts a Sea-Level Station Monitoring Facility that includes GLOSS Core stations. VLIZ provides a web-based global sea-level station monitoring service for viewing sea-level data received in real-time from different network operators primarily via the GTS, but also through other communications channels. The service provides information about the operational status of GLOSS stations through quick inspection of the raw data stream. 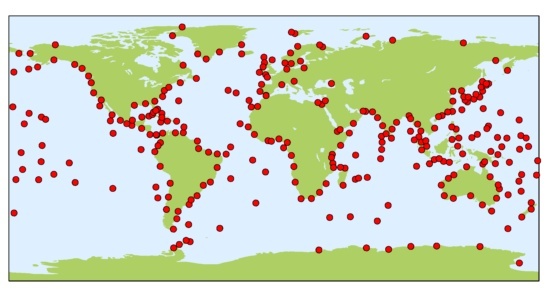 The sea-level station monitoring system also runs a web-service for direct data access. The sea-level station catalogue system developed and maintained at VLIZ links sea-level station metadata repositories.